Rice Pudding Just Got Tastier! I remember when I was little and my Grandma used to make rice pudding. I hated it! I have no idea why, and I can’t remember when exactly I changed my mind about it. But somewhere along the way I started loving it so much that I could eat it every day. There’s just something so satisfying about the texture combinations in rice pudding that can’t be explained. If you’ve never tried it – make this one your first! 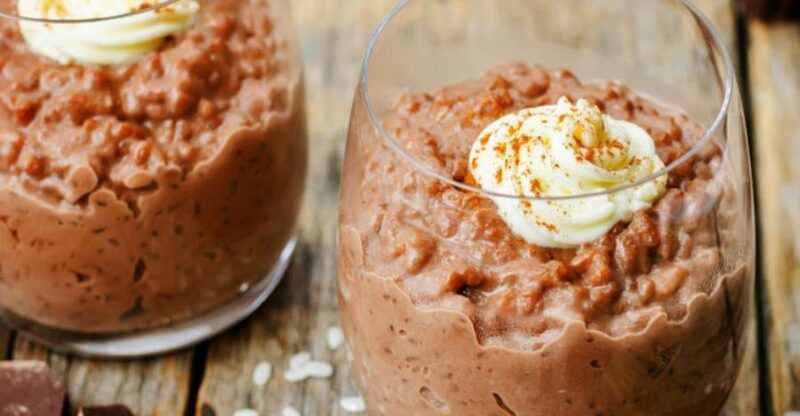 Made easy in your slow cooker, this effortless chocolate rice pudding is so simple and delicious you’ll need to make a double batch, “just in case”! One you try this it’ll be your new dessert craving! Serve this with some whipped cream and ground cinnamon for a delicious after-dinner treat. Quick Tip: You can serve this warm straight from the slow cooker, or cold after refrigerating. Delicious either way! Well an Apple a Day Does Keep the Doctor Away, Right?! This Slow Cooker Chicken Meal is Taking Over Pinterest!